This is the last of the Halloween decorations. 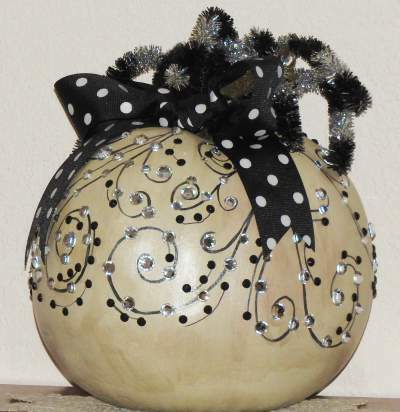 For my DD's dining table, I painted a 9" faux pumpkin off-white and added a pearl varnish. I then glued a bunch of clear and black crystals on the pattern I painted on. The true sparkle doesn't show well since I photo'd it with a zoom lens in a small hallway. 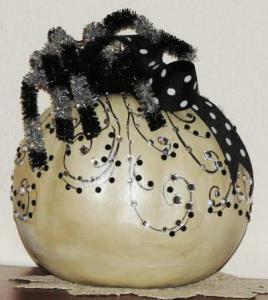 I added a cute bow and a sparkly spider for effect. The spider can be removed and different bows changed for different holidays. This was fun to make and I enjoyed more painting. Your daughter must be very pleased. I have a filling you will have a many more "orders" coming.. Thanksgiving & Christmas and......:................). Thank you- all of you. I'm glad you liked the pumpkin. I won't be making anymore this year, that's for sure. I'm moving on to Christmas gifts. And oh what a list that is! It looks elegant and whimsical. The spider and bow were just the perfect touch.